A faulty valve caused the accidental release of about 2 million gallons of untreated wastewater into a slough in Sonoma Valley, a county water official said Saturday. The valve on a pipeline in the Sonoma Valley County Sanitation District failed to fully close and was leaking wastewater for about 24 hours into Schell Slough, said Ann DuBay, a Sonoma Water spokeswoman. The flow was stopped at 10:45 a.m. Saturday, she said. State and regional authorities were notified, and specialists sent to the spill site did not notice any dead or distressed fish or other species, DuBay said. The valve is part of a system that collects wastewater from the equivalent of about 17,000 Sonoma Valley homes. The wastewater is treated at a plant on Eighth Street East, near the city of Sonoma. Water in Santa Rosa’s fire-ravaged Fountaingrove neighborhood is safe for drinking and bathing, city officials said Thursday. 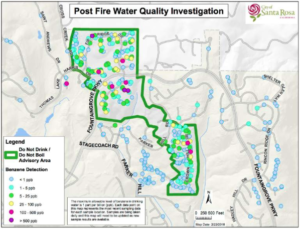 The city lifted the water quality advisory in place since the historic Tubbs wildfire in October 2017 melted water pipes in the hilly neighborhood and contaminated sections of the water system with benzene, which can cause cancer. Residents living in the advisory area of Fountaingrove, where about 1,600 homes burned in the most destructive fire in California history, will get individual notices from the city about the water safety. Water testing will continue for at least a year to ensure safe water conditions, city officials said. Jennifer Burke, the city’s deputy director of water resources, said the city will continue sharing with residents the results from subsequent tests. River otters are making a comeback in Sonoma County and across the Bay Area thanks in part to improved water quality and habitat restoration projects, according to ecologists. In recognition of last week’s World Otter Day, local otter fans are hosting a Saturday lecture and series of kids’ activities at the Petaluma Regional Library from 11 a.m. to 1 p.m. The message of the lecture will be one of resiliency and recovery, said Megan Isadore, executive director of the River Otter Ecology Project, which is hosting the North Bay event. A second event is also taking place in the South Bay. Pollution of the San Francisco Bay and surrounding waterways decimated river otters during the middle of the last century, Isadore said, causing them to retreat to less polluted areas. Sonoma County officials will ask state regulators for more time to craft new rules governing the estimated 45,000-plus septic systems in the county’s unincorporated areas after facing resistance from rural residents who feared the changes could force them to undertake costly and unnecessary upgrades. The Board of Supervisors decided Tuesday to seek a six-month extension so county leaders can gather more community input and address concerns raised by homeowners, many of them from along the Russian River and on Fitch Mountain outside Healdsburg. Supervisor Lynda Hopkins embraced the idea of an extension, expressing sympathy toward some of the criticisms raised by residents in her west county district. Hopkins advocated for more flexibility in the standards, which as proposed could require more expensive evaluations of replacement septic projects, among other changes intended to prevent wastewater systems from contaminating local watersheds. Fifty miles north of the Golden Gate Bridge, California’s Sonoma County is famous for its wine-country image — a patchwork of picturesque rolling hills and vineyards graced with moderate temperatures all year round. Beyond the grapes and quaint roadside tasting rooms, oak woodlands rich with black oak, Douglas fir, madrone, and California laurel provide habitat for abundant wildlife and ecological services like erosion control and water filtration to the surrounding area. Typically hot and dry from midsummer through late fall, these woodlands also comprise an ideal environment for wildfires. It was here that flames ignited on the evening of October 8, 2017, fueled by winds of 50 miles per hour. The fires, which also erupted in neighboring Napa and Mendocino Counties, spread quickly, reaching residential areas in the city of Santa Rosa late at night. Flames devoured nearly 250 square miles of open space and urban development, including 6,000 homes and business structures. The Tubbs, Nuns, and Pocket Fires also claimed more than 20 lives in Sonoma County, and sent a cloud of toxic ash over a wide stretch of the San Francisco Bay Area for weeks. Local ecologists promptly took action, driven by concerns about chemicals seeping into the region’s farmlands and streams, the Russian River, and eventually the Pacific Ocean. Ohlsen is part of the grassroots Fire Mediation Action Coalition that formed in response to widespread fire damage. In the aftermath of the fire, this group of ecologists, organic farmers, wildlife biologists, and residents discussed the probability of heavy metals, PCBs, dioxines, and a multitude of other chemicals contained in the ash contaminating local creeks, drinking water, and soil. Given the nearly 600,000 acres of agricultural land in Sonoma County, preventing chemicals from contaminating farms and vineyards was considered critical and urgent. Benzene, the cancer-causing chemical that city officials believe was sucked into its water system in a heavily burned area of Fountaingrove, is continuing to be discovered outside the advisory area, including one place in Coffey Park, city officials acknowledged for the first time this week. But officials insist the new findings are not an indication the problems in Fountaingrove are migrating to other parts of the city. However, they have now found 20 locations outside the Fountaingrove advisory zone with elevated levels of benzene. Fourteen of the locations were identified in the last month after the city aggressively expanded its testing program. All but one — a burned lot on Waring Court in Coffey Park — were located near the advisory zone in Fountaingrove. City officials said the new problems have been easy to resolve, confirming their conclusion that the 184-acre advisory area in Fountaingrove has a unique and pervasive problem far different than any other area of the city. The entire water-delivery system in a 184-acre section of the devastated Fountaingrove neighborhood will likely need replacement after becoming contaminated with benzene, and it appears the city will initially be on the hook for a project whose estimated costs have soared to $43 million. The intensive investigation into the exact cause of the contamination continues, but officials say they now understand how the cancer-causing hydrocarbon found in gasoline and plastics made it into the water mains in the area. The city’s team of water engineers, consultants and regulators is “converging on the recommended approach” that would require the “full replacement of the distribution system, from the water mains to the meters on the properties” and related equipment like fire hydrants within the advisory area, Ben Horenstein, director of Santa Rosa Water, said Thursday. The cost of that solution, which Horenstein had previously estimated at up to $20 million, has now more than doubled, and completion may take significantly longer than the year he initially hoped. The development raises a host of questions about how quickly the devastated Fountaingrove neighborhood, which lost 1,420 homes in the Tubbs fire, may be able to recover, how the city can fund the needed repairs, and what it means for residents who still live there. Santa Rosa may be zeroing in on the cause of the contamination in the water supply of the devastated Fountaingrove neighborhood, but there are also troubling signs that the problem may extend beyond the immediate advisory area. Since Jan. 24, when the city last released detailed test results, the city has found 58 additional instances of benzene in the drinking water in the Fountaingrove area. The vast majority came from the 184-acre area north and south of Fountain Grove Parkway around Fir Ridge Drive, an area once home to 350 families. Only 13 homes remain following the October wildfires. Residents of the area have been under a strict advisory for months to not drink or boil the water while the city tries to find the source of the contamination and fix the problem, something that could cost upwards of $20 million if the area’s water system needs replacement. But a handful of tests have recently detected benzene in areas outside the advisory zone, a new development that may complicate the 3-month-long hunt for the cause of the contamination. In response, the city is launching a more aggressive regimen of water tests covering all the burned areas of the city, including Coffey Park, in its effort to make sure other burn zones aren’t experiencing similar problems. Santa Rosa officials are scrambling to figure out why the drinking water in a wildfire-ravaged section of Fountaingrove is contaminated with a chemical commonly found in plastics and gasoline. A team of local water quality officials, regulators and experts has been working for 2½ months to understand how the volatile hydrocarbon benzene is getting into the water system and how to fix the problem. They suspect the heat of the Tubbs fire, which incinerated 1,400 homes in the area, may have damaged parts of the water delivery system, such as plastic water pipes or meters, and caused the dangerous carcinogen to leech into the neighborhood’s water supply. But despite hundreds of water tests, detailed mapping of the results and targeted equipment replacement, the problem still persists, leaving officials confounded and a $20 million replacement of the water system a real possibility. The disaster of October’s wildfires didn’t stop once the flames were finally extinguished. The toxic ash left by the firestorms—incinerated plastics, hydrocarbons, solvents, pesticides, heavy metals—lay like a ticking bomb on home sites, awaiting a rain storm to wash the deadly debris into drains and creeks. Once in waterways, the lethal plume could infiltrate watersheds and imperil drinking water and aquatic life. But thanks to an unprecedented public-private partnership, protection from that environmental hazard in hard-hit areas like Coffey Park, Larkfield-Wikiup and Fountain Grove has come from an unlikely source: mushrooms. Erik Ohlsen, a landscape architect and permaculture educator, saw that second wave of disaster coming and acted quickly to rally a diverse team of volunteers, environmental groups, landowners and public agencies to deploy cutting-edge bioremediation techniques using mushrooms and compost to absorb and neutralize the deadly runoff. He created the Fire Remediation Action Coalition on Facebook to help organize the effort and spread the word. And word spread quickly. The project took off as another example of the volunteerism and generosity that have characterized local efforts after the fire. Sebastopol’s Gourmet Mushrooms donated thousands of pounds of substrate used to grow mushrooms. Sonoma Compost and West Marin Compost donated compost. Petaluma’s Wattle Guy provided, you guessed it, wattles—barriers and fences made from natural materials like rice straw and sticks. And groups like Russian Riverkeepers and the Clean River Alliance marshaled volunteers to make, fill and install the wattles and monitor water flow during and after the recent rains.